Just when you finally finish picking the colors for your painting project, you realize that you still need to choose the type of paint you want! What paint sheen should you go for -- flat paint, eggshell or satin finish paint, semi-gloss or gloss? You'll also need to choose between latex paint or oil-based. But don’t worry; just read this guide to understand the different types of paint. Because latex paint also resists yellowing and mildew better than oil-based does, it’s ideal for bathrooms, kitchens, and laundry rooms, where there is often moisture. Oil paints of high quality are harder and more abrasion-resistant than latex paint. They also have a slightly higher gloss. A great perk to oil-based paint is that it goes on more smoothly and is more durable in the long run. Disadvantages are that these paints have a stronger odor, take longer to dry, and require a solvent such as paint thinner for cleanup. Paint sheen means the level of glossiness in paint. 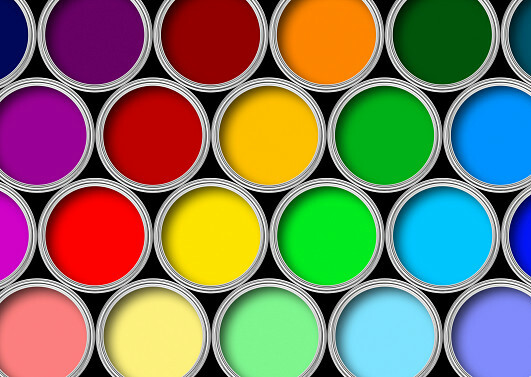 Today, most paints come in one of the following sheens: flat, satin (or eggshell), semi-gloss, and gloss. Flat paint has the lowest paint sheen available and when dry, is completely non-reflective with a matte finish. Flat paints are great because they make imperfect surfaces appear smoother and more uniform. That’s why we recommend flat paint for drywall or anywhere that is not sanded well. If the wall gets scratched or dinged after you’ve painted, you won't have to worry so much, as nicks and scratches blend in fairly easily! One big disadvantage to flat sheen is that its porous texture helps the paint holds onto dirt, making cleaning more difficult. Your best bet: use in areas that are not frequently soiled. Eggshell or satin paint is also known as “low-luster.” These types of paint are slightly more lustrous than flat paint. The slight paint sheen is what makes eggshell and satin finish able to bring a warm look and feel -- and a certain depth -- to a room. This kind of paint is also easier to clean than flat and can be used on any wall in your home. Before you commit to a major project, though, cover a small area of one wall with eggshell paint to make sure that this look is what you want to achieve. Semi-gloss paint has more luster. This paint sheen is frequently used for children's rooms, kitchens and bathrooms because it is durable, damage resistant, and easy to clean. If you choose to go with a semi-gloss paint, make sure you choose one that is 100% acrylic latex, since that is the highest quality latex paint. Keep in mind that semi-gloss paint shows a lot of imperfections, so if you have imperfect walls (on the one hand) and young children (on the other), weigh the pros and cons carefully. Gloss paint is the toughest and most durable of all house paints -- and the shiniest, as well! This very high sheen paint is popular for doors and in areas susceptible to getting dirty. It is also commonly used to coat baseboards, moldings, door frames, and exterior trim. Careful prep work to smooth all surfaces is essential before you start painting with gloss. No matter which type of paint you select, hiring a reliable painting contractor ensures the most professional results.